The No. 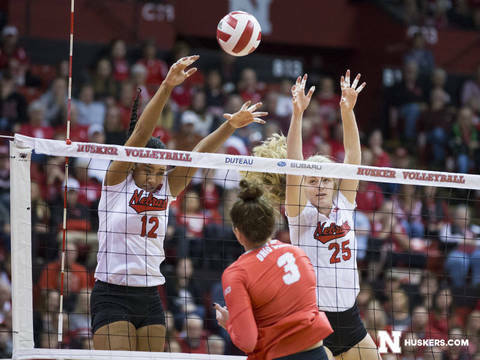 6 Nebraska volleyball team won its seventh straight match with a 25-15, 25-12, 25-12 sweep over Ohio State in front of a crowd of 8,267 at the Bob Devaney Sports Center on Friday night. Lexi Sun had 12 kills with no errors for a season-best .522 hitting percentage to lead the Huskers (23-6, 14-5 Big Ten). Nebraska hit .353 for the match and committed six attacking errors, tying its fewest in a Big Ten match since 2012. The Huskers were just as sharp defensively, holding Ohio State (12-19, 3-16 Big Ten) to a season-low -.044 hitting percentage. The win marked the Huskers’ first over the Buckeyes in Lincoln since 2011 at the NU Coliseum. Mikaela Foecke had nine kills, nine digs and four blocks, and she moved past Kadie Rolfzen for sixth place on Nebraska’s career kills chart with 1,567. Lauren Stivrins added six kills and a team-best seven blocks, as Nebraska tied its season high for blocks in a three-set match with 13. Callie Schwarzenbach and Jazz Sweet each had three kills, with Schwarzenbach adding five blocks. Nicklin Hames notched 28 assists and eight digs, and Kenzie Maloney had a match-high 13 digs to lead the Huskers to a 48-40 edge in that category. Sun had nine digs to go with her 12 kills. Lauren Witte had eight kills to lead the Buckeyes. Set 1: After falling behind 2-1, the Huskers scored seven of the next nine points to take an 8-4 lead. Sweet, Hames and Sun all had kills in that stretch, and Stivrins and Foecke had a block. Sun tacked on three more kills and a block with Schwarzenbach to help make it 14-6 Huskers after a 5-0 run. The Buckeyes scored three straight points to cut Nebraska’s lead to 17-13 and force a Husker timeout, but a 5-0 response by the Huskers – highlighted by a Stivrins solo block and another Sun kill – restored a 22-13 lead. The Huskers won 25-15, hitting .312 while holding Ohio State to .000 hitting. Sun had nine of Nebraska’s 13 kills in the set, and the sophomore hit .692 in the set. Set 2: Nebraska’s seventh block of the match, this one by Hames and Schwarzenbach, gave the Huskers a 7-4 lead, and Sun’s 10th kill made it 10-5. The lead went to eight, 17-9, after Foecke’s fifth kill of the match, and four unforced Buckeye errors gave the Huskers a 23-12 advantage. Sun added another kill for set point, and the Huskers finished the dominating set two win at 25-12 on a block by Schwarzenbach and Sun. NU hit .321 in set two and held Ohio State to -.100 hitting. The Huskers had six blocks in the frame to increase their match total to 10. Schwarzenbach was in on four blocks in set two. Set 3: Stivrins posted three kills and a block, and Maloney served an ace to get Nebraska off on the right foot with a 7-3 lead. Back-to-back Husker passing miscues allowed Ohio State to get within 7-6, but Foecke blasted her sixth kill and Stivrins swatted a Buckeye attack to make it 9-6 Huskers. Ahead 11-9, Nebraska went on a decisive 7-0 run to take an 18-9 lead. Capri Davis started it with a kill, and Sun served back-to-back aces after kills by Sweet and Schwarzenbach. Sun blasted her 12th kill to put Nebraska ahead 21-12, and Foecke hammered an overpass after a Hayley Densberger serve for a 10-point lead. A pair of Ohio State hitting errors made it 24-12, and Nebraska finished off the sweep with a 25-12 win, ending the set on a 14-3 run. Up Next: Nebraska finishes the regular season against Maryland on Saturday at 7 p.m. at the Bob Devaney Sports Center. The Huskers will recognize their three seniors – Mikaela Foecke, Kenzie Maloney and Brooke Smith – following the match. The match will be televised on NET, streamed at BTN2GO.com and can be heard on the Husker Sports Network.